Share the joy of Food as Medicine with your friends and family. Gift a certificate from The Food Pharmacy. Available via our Square Market store. 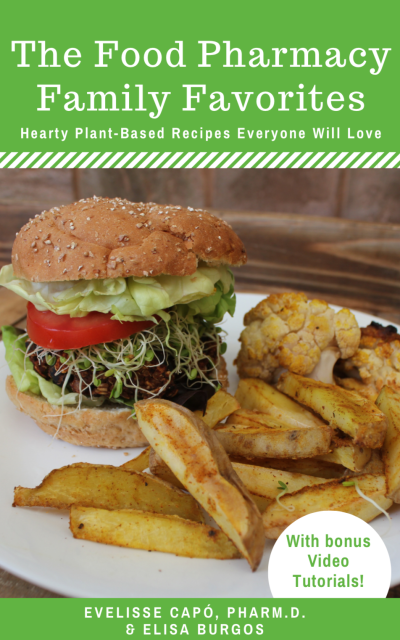 Whole foods, plant-based recipes hearty enough to power the whole family! Enjoy delicious international and All-American recipes: burgers, fries, shakes, fajitas, paella, sushi bowls, breakfasts and many more dishes… all completely oil-free, gluten free and jam-packed with nutrition from whole plant foods. Includes handy tips for healthy eating and bonus video tutorials from our instructors, Evelisse Capó, PharmD and Elisa Burgos.